In Bocas del Toro, Panama there is a resident population of bottlenose dolphins estimated between 100 to150 animals. Half of these animals are believed to be year-round residents. Most of our work has concentrated in Bocastorito Bay also known as Dolphin Bay. Here is were most of the dolphin-watching activities concentrate. The bay is an important nursing ground for mothers and their calves. It is also a important habitat for feeding and social activities. 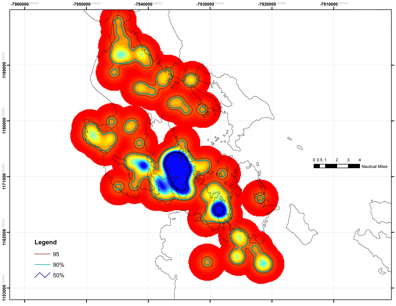 This map shows the core areas of dolphin sightings in Bocas del Toro. The large blue spot is in Bocastorito (Dolphin Bay). The same boat but at 1 m distance from the research boat. Notice that the green color covers the entire graph. This is just one boat imagine 25 boats simultaneously following a dolphin most of which use noise engines. This project started in 2004 monitoring the acoustic and behavioral responses of the bottlenose dolphins of Bocas del Toro to dolphin-watching boats. Our findings indicate that dolphins respond in various ways when multiple boats are present (1) changing their signal frequency and duration presumably to reduce masking by engine noise, (2) an increase in avoidance behaviors such as traveling, and (3) a decrease in group size. Currently, we are comparing the effect different boat maneuvers in dolphin behavior and we are particularly interested in determine if groups with calves are more likely affected by boat presence and maneuver. More about this project follow us in our website blog and facebook! Main Researcher: Laura J. May-Collado, Jose David Palacios, Evi Taubitz, Shakira Quinones, Dalia Barragan, Susana Caballero, Monica Gamboa. Bottlenose dolphin predictability and site fidelity to Bocas del Toro has promoted the establishment of several dolphin-watching operators, which have been growing exponentially in the past 15 years. The Government Conduct guidelines are appropriate to conserve the dolphin’s acoustic environment (Resolution ADM/ARAP NO. 01, 2007) but few operators are well informed about these guidelines and their importance. Although Bocas del Toro bottlenose dolphins are notably plastic in their behaviour and acoustic communication the growing tourism development and associated increase in boats transiting the Archipelago may challenge their survival by increasing engine noise to levels that may render their habitat less habitable. Our preliminary results show that dolphin acoustically response to boat presence by increasing signal frequency and duration, they increase signal emission, and increase frequency of avoidance behaviors. A single boat with a 115hp engine at 50 m distance from the research boat. The y axis is the frequency and the x axis the time. The green color represents the 'intensity' of the sound as the boat approaches. In 2012 we started collecting biopsies to determine the genetic diversity and structure of bottlenose dolphins. Previous studies done by Susana Caballero, have demonstrated the importance of genetic techniques to identify dolphin conservation units. In her latest publication, she shows that coastal Caribbean dolphin populations consist of discrete units. We are figuring out where the Bocas del Toro population fits and if this population is close or interbreeds with neighboring populations in Costa Rica and other parts of Panama. To follow this project go to our project website and facebook!